This timely interactive program is a positive response to today’s fast-changing and ever-evolving marketplace conditions. It adopts the premise that during these challenging times, (created by accelerated competition and volatile change) you must make smart competitive decisions today, as well as sustain a future-focused approach in order to ensure continued growth for tomorrow. By focusing on how to compete for today and build for tomorrow, the discussion of how to get ‘there’ from ‘here’ is ever at the forefront. 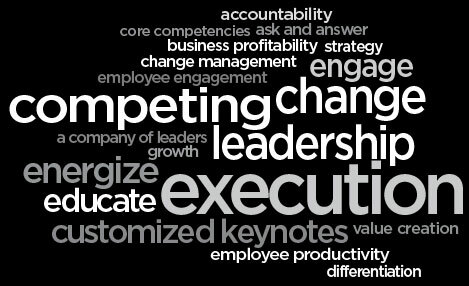 In today’s marketplace where do you see your organization’s competitive advantage? What ideas are you entertaining to ensure a competitive position tomorrow? What communication channels are you employing/planning to employ to maximize your competitive advantage? What has been done to ensure that those who are to implement the strategies understand the reasons behind them? Re-energize existing strategies and find new competitive strategies to grow your business. Identify and remove obstacles to ensure effective execution. Identify leader’s role and responsibility in a highly competitive organization today—and for tomorrow. Understand today’s highly competitive environment and how to maximize their own competitive advantage in this environment. Grow their business today—preparing their business for tomorrow—from a competitive perspective. Use differentiation as a competitive advantage to engage and loyalize existing customers, as well as find new customers. Grow and maintain a highly competitive company of leaders.